I am a massive fan of Special Features on DVD. I enjoy learning about the filming process, particularly stunts. I’ve been spoiled over the years with the superb Stargate featurettes by Ivon Bartok so I was stoked to hear there was a stunt featurette on the Arrow season 1 DVD. Let me assure you the featurette by Amity Pictures (Written & Produced by Jeff Maynard & Alexander Gray) did not disappoint. 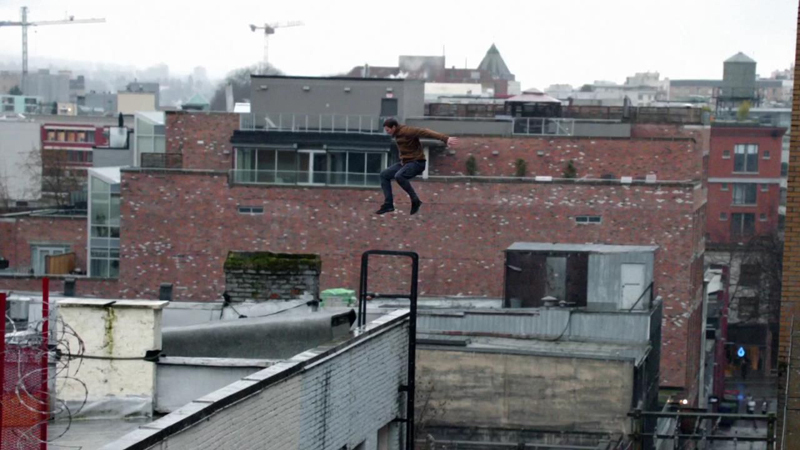 The featurette is well edited, focusing on two key areas of stunts – fight scenes and the rooftop jump from Salvation and going back and forth between the two. It opens with the filming of the rooftop jump scene prior to the Parkour sequence in Salvation. Arrow Stunt Co-ordinator JJ Makaro and Arrow Stunt double Simon Burnett describe the sequence. There are a few subliminal things you learn while watching featurettes and one is the lingo. A gag is another term for stunt. An entire stunt sequence may be broken up into several gags. JJ explains how the rooftop jump is broken up into several gags, some performed by Stephen Amell, others by his stunt double Simon Burnett. First up is a freestyle 12 foot jump from one parapet to the next, followed by the big 28 foot jump across from building to building. It’s fascinating that the stunt team often use frames from the Arrow comics as inspiration for the body positioning on the gag, but do it in a realistic way. It’s a fantastic way to integrate each medium. The stunt team are always pushing the limits to portray Arrow as the best martial artist or Parkour guy, using their own knowledge and experience as well as research on the web. So much rehearsal goes into these gags to get it right and keep it safe for the performer. In the Fight School portion, Arrow Fight Co-ordinator James Bamford describes his process choreographing fight sequences. The interview takes places at Riverview, a former mental health facility used in many film and TV productions, which looks like it’s in need of a coat of paint (pause the DVD and you’ll see numerous black scuff marks on the walls. I imagined all sorts of ways they got there. I kept looking for holes in the walls). James describes the great dialogue he has with the writers in the preparation. He has a lot of freedom in designing the fight scenes, with simple direction coming from LA to “make it cool”. James discusses his Martial Arts experience, which includes more than merely classical training. He uses all of this experience when choreographing fight sequences. I’ve heard him explain in other interviews that he’s always asking questions. If one character strikes another in a certain way, what’s going to happen, how would they fall or react, or bleed as individuals are different. Someone with high cheekbones will suffer a facial punch differently to another person. James is a big advocate of realistic fight scenes with blood. The stunt team have so much respect for each other and JJ speaks so highly of James. That is exactly why fans of the show appreciate the action on Arrow. It isn’t action for the sake of it. It’s tightly woven into the story and characters. I know I may be biased but I strongly believe that apart from casting Stephen Amell as Arrow, the hiring of this Arrow stunt team is an integral reason for the success of the show. BamBam’s previz (short for previzualization, a way to visualise complex scenes in a movie or TV show before filming) have become a fan favourite through the Arrow stunt videos shared on the CW website and through YouTube. James takes us through a rehearsal for the Slade vs Shado fight sequence and demonstrates completing the video with music from his iPhone. The camera angles he uses in Previz frequently end up in the show as witnessed on the split screen comparison of the Previz vs Final Show of the Slade/Shado fight. I hadn’t really thought about the way Arrow used bows and arrows compared to other shows. It is original. James studied the bow and considered the balance point, what it felt like and decided to choreograph scenes using it as a sword and using the end to hook and trap an opponent. You certainly don’t see that on The Avengers. The detail that goes into the archery is amazing. Stephen had archery training for weeks (2 hours each day) prior to filming the show to learn proper technique and there is an Archery expert on set to ensure the poses are genuine. For safety sake no arrow is ever fired, all are computer generated. At the end of the featurette it’s worth pausing and considering all of what you’ve seen is on a TV show budget with TV schedules, rather than the film equivalent. It’s quite staggering and a credit to the Stunt team. I hope that’s given you a taste of what’s on the DVD. I urge all Arrow fans to buy the bluray or DVD and watch Fight School/Stunt School. Screencaps courtesy of Screencapped.net. They rock!